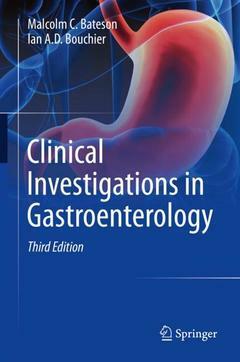 Clinical Investigations in Gastroenterology Bateson Malcolm C., Bouchier Ian A.D.
Auteurs : Bateson Malcolm C., Bouchier Ian A.D. The new edition of this book provides a comprehensive review of the basic tests available in gastroenterology. Chapters examine widely-used modern techniques such as ultrasonography for Crohn?s disease, capsule endoscopy, elastography and video proctosigmoidoscopy among others. Fully updated to reflect the recent advances in the field in the last 20 years, this volume evaluates investigations for their current clinical usefulness in the management of patients. The reader will benefit from a critical analysis describing those older tests which have proved their worth alongside the newer procedures which have been introduced. Emphasis is placed on those techniques of which the authors have personal experience. The book is designed for trainees and clinicians without special expertise in gastroenterology, as well as being a shelf manual for the gastroenterologist and the staff of gastroenterology investigation units. Malcolm C. Bateson is a medical graduate of Birmingham University. After hospital posts in London and Cambridge he went to Dundee, first as a research fellow then as a lecturer in medicine. He has been a consultant physician and specialist in gastroenterology in County Durham for 27 years, actively involved in research in bile acids, peptic disease and Helicobacter pylori. Ian A.D. Bouchier is a medical graduate of Capetown University. In the course of a distinguished career he was Professor of Medicine in first Dundee then Edinburgh. A prolific author, he has produced several standard medical textbooks.